You've seen it everywhere - from fashion magazines to stores. Rich tribal prints are definitely a big trend this season. If you're a little shy about going off the reservation, start off small with maybe a cuff or pair of earrings. But if the tribal trend is drumming your name - have fun and go for a stand-out dress like the one shown below! Tribal trend Hot or Not? I love it in moderation. That HOH cuff is amazing. Would love to add that to my accessories! I love the tribal trend! I just wore a shirt from Zara recently that had a tribal print...so fun! Love all of these picks, especially that dress! These are so gorgeous!!! 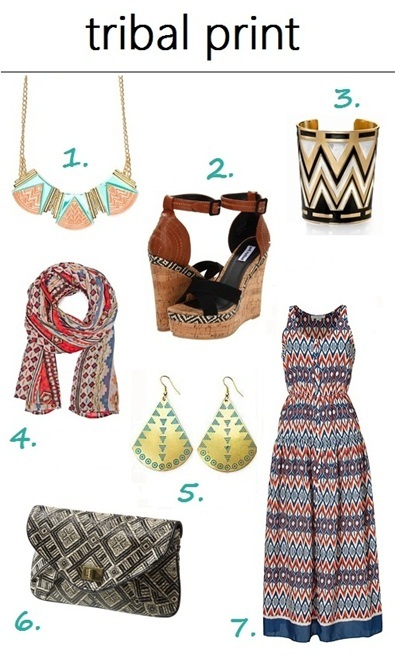 !love the tribal trend! I love it, but in moderation. An awesome scarf, some earrings or a necklace? Great. That dress? It kinda reminds me of a sofa. Or at least that's what I'd look like in it.